On Friday, April 13, 2018, Gary Sturgeon clinched the championship of the 2017 CFR-Detroit racing series by finishing 4th out of a field of 13 drivers at the Abu Dhabi Grand Prix held on the Yas Marina track. Garry Kaluzny won the race, his 2nd victory of the season, thus clinching 2nd place in the season standings for Kaluzny. Richard White (2nd place) and Jack Beckman (3rd) were the other podium finishers. 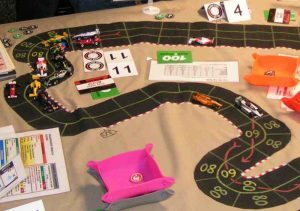 The race was held at Pandemonium Games in Garden City, Michigan. 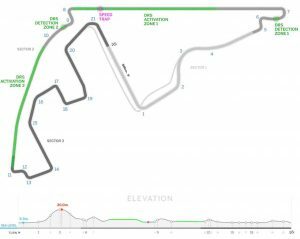 Yas Marina 2017 track diagram. The qualifying bidding was once again using the standard Championship Formula Racing procedure where all drivers secretly bid a number of their wear and/or skill markers. 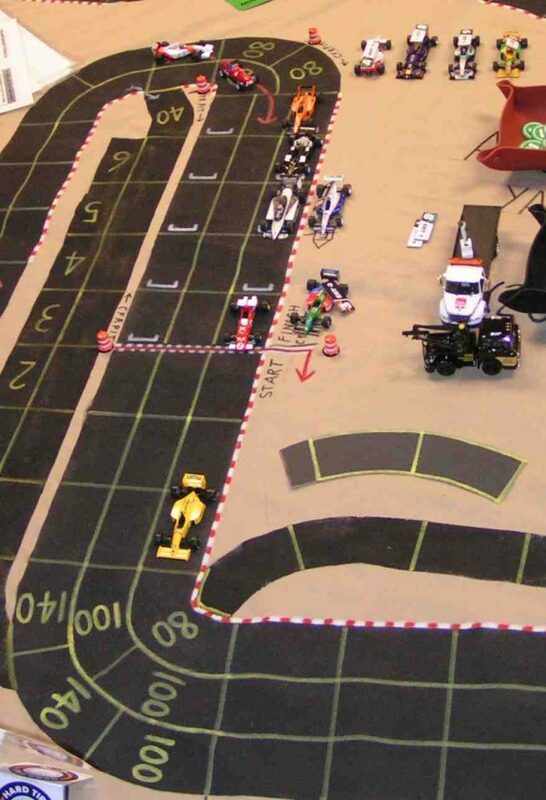 Each wear marker counted as 1.0 for bidding, while each -1 skill marker counted as 0.5 towards qualifying. Chad Marlett outbid the competition to get pole position with a bid of 8.5 (6 wear + 5 skill). Starting beside Marlett on the front row was Mike Cook with a bid of 6.5 (0 wear + 13 skill). Cook used his single -3 skill marker and 10 of his -1 skill markers, leaving him with only two -1 skill markers for the actual race. Starting in 3rd place was Jack Beckman with a bid of 5.0 (2 wear + 6 skill). Richard White started 4th with a bid of 4.5 (3 wear + 3 skill). Garry Kaluzny was 5th with a bid of 4.0 (2 wear + 4 skill). Three drivers were tied with bids of 3.0, so they rolled percentage dice for starting positions. Gary Sturgeon (0 wear + 6 skill) rolled 89 to start 6th, Jim Landis (1 wear + 4 skill) rolled 75 to start 7th, and Mike St. Peter (2 wear + 2 skill) rolled 61 to start 8th. Ninth and 10th positions were also diced for, with Brian Robinson (2 wear + 1 skill, rolled 92) getting 9th and newcomer Mike Hernandez (2 wear + 1 skill, rolled 02) starting 10th. Jim Magnanti (0 wear + 4 skill), a Speed Circuit racer from the 1980s who was racing in his first CFR race, started 11th. Greg Lim bid 1.5 (0 wear + 3 skill) to start 12th, and Gary Kempen started 13th with a bid of 1.0 (0 wear + 2 skill). 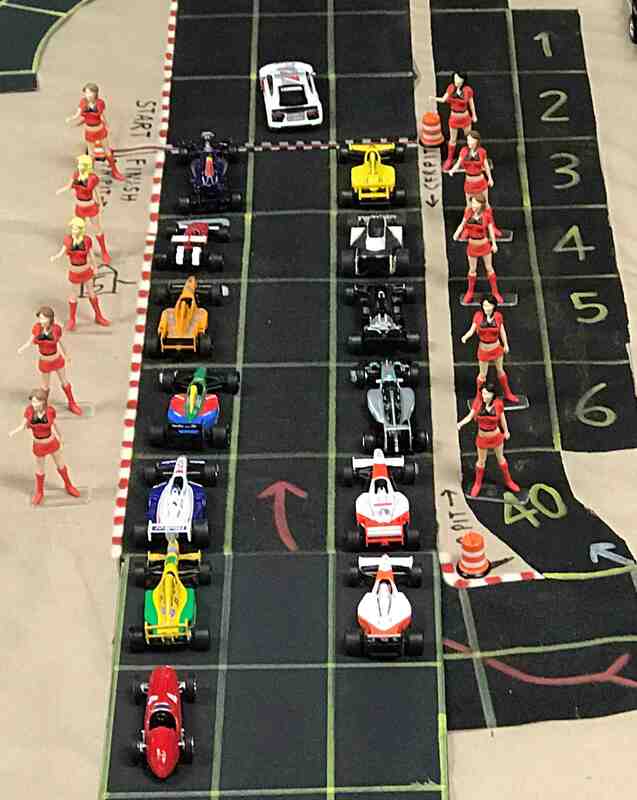 Starting grid at Yas Marina: 1st row:Chad Marlett (Red Bull) & Mike Cook (yellow Lotus); 2nd row: Jack Beckman (red Ferrari) & Richard White (Brabham); 3rd row: Garry Kaluzny (orange McLaren) & Gary Sturgeon (black Lotus); 4th row: Jim Landis (Benetton) & Mike St. Peter (silver Mercedes); 5th row: Brian Robinson (Walker Racing) & Mike Hernandez (orange & white “driverless” McLaren); 6th row: Jim Magnanti (yellow & green Benetton) & Greg Lim (orange & white McLaren with a driver); 7th row: Gary Kempen (red Ferrari). Yay for the Grid Girls! When the green flag dropped, Chad Marlett, since he was on soft tires, used a wear to increase his start speed from 60 to 80 mph. Mike Cook, on hard tires, rolled dice to increase his start speed to 80 mph, so both Marlett and Cook made it into the first corner before all of the trailing cars. Richard White took advantage of his soft tires to also use a wear to go 80 mph, thus taking 3rd place from Jack Beckman. Beckman, on hard tires, only went 60 mph, while Garry Kaluzny, who started directly behind Beckman but on soft tires, used a wear to go 80 mph and thus pulled alongside Beckman. Gary Sturgeon (hard tires) only went 60 mph, while Mike St. Peter, even though he was on hard tires, rolled dice to get to 80 mph, passing Jim Landis and pulling alongside Sturgeon. Landis, although on soft tires, only went 60 mph for his start speed. Brian Robinson used a wear to boost his start speed to 40 mph, but nonetheless, Mike Hernandez went 60 mph and got in front of B. Robinson. Jim Magnanti and Greg Lim both went 60 mph to pull alongside B. Robinson, and Gary Kempen merely started at his 20 mph start speed. The pack races away from the start line! The running order: Marlett; Cook; White; Beckman; Kaluzny; Sturgeon; St. Peter; Landis; Hernandez; B. Robinson; Magnanti; Lim; and Kempen. On the next move, Marlett accelerated off the corner to 140 mph, thus opening a gap of 3 spaces over Cook as Cook was only able to accelerate to 100 mph as he was stuck on a posted speed space in the middle of the 1st corner. Both White and Kaluzny pulled alongside Cook coming out of that 1st corner. The other drivers stayed in their same positions. Through the first corner, Marlett opens a lead of three spaces over Cook, White, and Kaluzny. 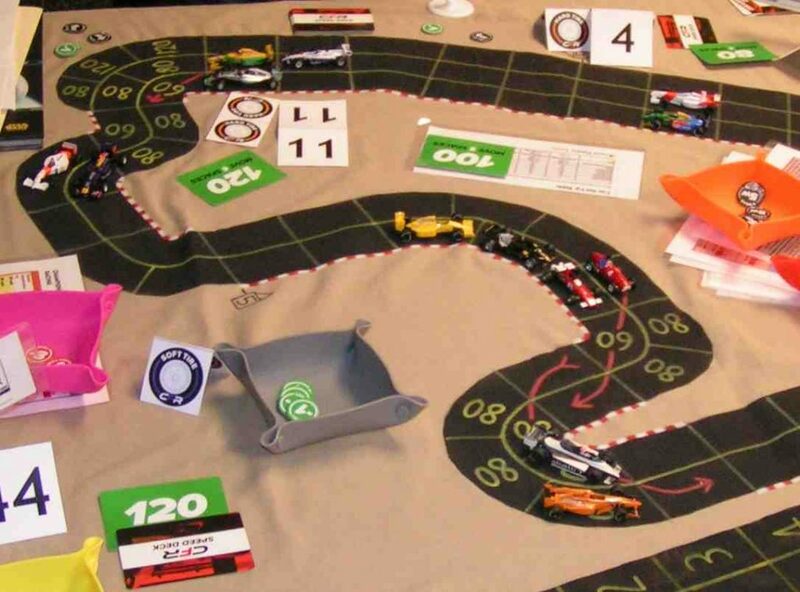 Marlett held his lead going into the hairpin just before the longest straightaway, although Kaluzny managed to get to the inside of the track from Cook and White. Mike St. Peter also pulled alongside Beckman, and Landis pulled alongside Sturgeon. Lim got into the 2nd corner in front of both B. Robinson and Magnanti. Marlett continues to lead heading into the hairpin. Marlett slowed to 60 mph for the hairpin curve, taking the inside lane. But White put on a burst of speed, driving 120 mph through the 60 mph corner just before the hairpin, and then taking the outside of the hairpin at 120 mph, thus pulling up alongside Marlett. Kaluzny went 100 mph and got stuck in the outside lane of the hairpin. Cook also went 100 mph, but ended up behind Kaluzny in the hairpin. White then accelerated to 160 mph coming out of the hairpin, with Marlett (who only accelerated to 140 mph) slotting in behind White. Kaluzny was 3 spaces behind Marlett, with Cook right on Kaluzny’s tailpipe. St. Peter took over 5th place from Beckman. White takes the lead down the long straightaway. The running order is White, Marlett, Kaluzny, Cook, St. Peter, Beckman, Sturgeon, Landis, Hernandez, Magnanti, Lim, Kempen, and B. Robinson. 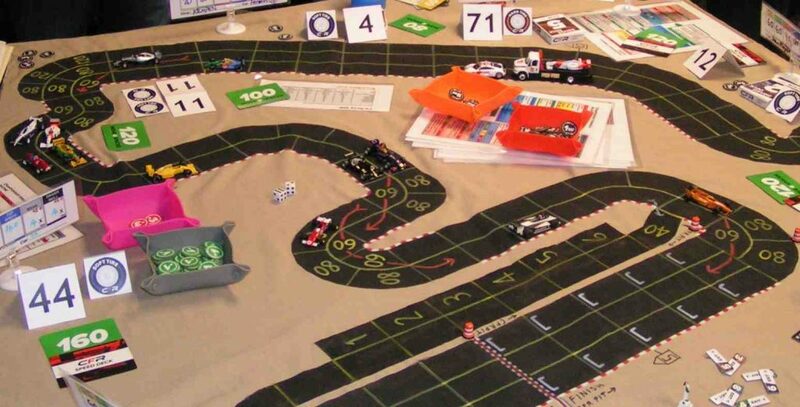 By the time the pack reached the left-right S-curves at the end of the 3-wide section, Marlett’s car was starved of wear, seeing as he had bid 6 of his precious wear markers in his bid to obtain the pole position. Kaluzny passed Marlett for 2nd, and was only two spaces behind White. Cook pulled alongside Marlett just before those S-curves. Kaluzny moves into 2nd place over Marlett. The running order: White, Kaluzny, Marlett, Cook, Beckman, St. Peter, Sturgeon, Landis, Hernandez, Magnanti, B. Robinson, Kempen, and Lim. 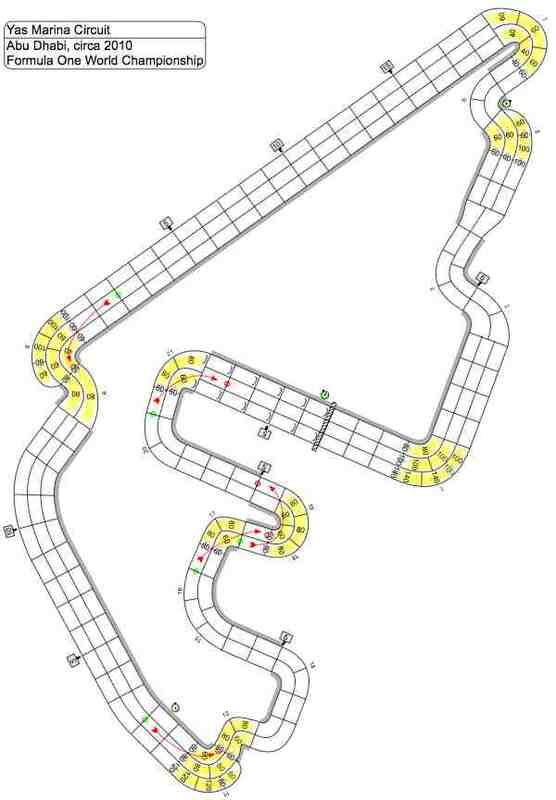 Through the next few curvy sections of the track (although those curvy sections did not have speed limits), White and Kaluzny manufactured a lead of several spaces over the rest of the pack. White and Kaluzny stretch out a lead over the rest of the pack. Coming into the 2nd-to-last corner of the 1st lap, Mike Hernandez was behind a glut of cars that included Marlett, Beckman, Cook, and St. Peter. Most of the pack is bunched up coming into the second to last corner on the 1st lap. Mike Hernandez is in the orange and white McLaren, directly behind Mike Cook’s yellow Lotus. Marlett and Beckman continued on at only 80 mph coming out of that corner, and Cook went 100 mph while St. Peter went 80 mph. Hernandez, the rookie driver, plotted 140 mph! After paying 2 wears and successfully making a chance roll to go 60 mph over the posted speed limit of the corner, he then attempted to force pass two rows of cars. In the first row of Beckman and St. Peter, Hernandez elected to force pass Beckman, who tried to block the pass. Hernandez made the pass safely, but had to lose 1 wear in the attempt. Hernandez then decided to force pass Marlett, but Marlett did not try to block, so Hernandez easily made the forced pass dice roll and so he gained four positions with a single move (and only using 3 wear to do so)! Mike Hernandez (orange and white McLaren just in front of Chad Marlett’s Red Bull) has just force-passed four cars to move into 3rd place! White and Kaluzny have just pulled into the pits so they are off to the side of the track. White and Kaluzny built enough of a lead so that they could both pull into the pits a turn before anyone else on the track. It should be noted that they both expended all of their wear in their gaining the lead over the rest of the pack. But of course, drivers should use all of their wear before deciding to pit, n’est-ce pas? As the pack came around the final corner before the start/finish line, Hernandez spun out, thereby negating all of the positions he had gained with his magnificent forced-pass of a moment ago. But Hernandez decided to pull into the pits after the spin, so did not affect any other cars that were still trying to negotiate that corner. Also pitting were the cars of Marlett, St. Peter, and Magnanti. Hernandez, Marlett, St. Peter, and Magnanti join White and Kaluzny in the pits. Mike Cook now became the leader on the track, as he did not pit. As he crossed the start/finish line, he gained 2 wear, as he was on hard tires, to add to his remaining 6 wear, thus giving him 8 wear for the next lap. Beckman also stayed on the track, gaining 2 wear, plus his remaining 6 wear. Sturgeon stayed on the track, gaining 2 wear to add to his 4 wear, and Kempen also stayed out, adding 2 wear to his remaining 3 wear for the 2nd lap. Jim Landis and Brian Robinson now pulled into the pits just as White and Kaluzny were leaving the pits. White and Kaluzny were now both on hard tires. Mike Cook takes the lead as he forgoes pitting. Beckman moves into 2nd place. The official classification order after the 1st lap was: Cook (+1); Beckman (+1); Landis (+4); White (0); Sturgeon (+1); Kaluzny (-1); Kempen (+6); Lim (+4); Magnanti (+2); Marlett (-9); St. Peter (-3); B. Robinson (-3); and Hernandez (-3). It was a pity that Hernandez spun immediately after pulling off his brilliant forced pass. That spin dropped him from 3rd to 13th. The numbers in parentheses indicate how many positions a driver either gained (+) or lost (-) from their starting position. However, after the pit stops were all resolved, the running order on the track was: Cook; Beckman; White; Kaluzny; Sturgeon; Kempen; Lim; Magnanti; Marlett; St. Peter; Landis; B. Robinson; and Hernandez. Running order after the 1st pit stops: Cook; Beckman; White; Kaluzny; Sturgeon; Kempen; Lim; Magnanti; Marlett; St. Peter; Landis; B. Robinson; and Hernandez. After the 1st pit stops, White quickly caught up to front-runners Cook and Beckman, while Kaluzny caught that trio by the hairpin leading onto the long straightaway. White (blue and white Brabham) battles Cook (yellow Lotus) for the lead as Kaluzny (orange McLaren) fights Beckman (red Ferrari) for 3rd place down the long straightaway. Meanwhile, Magnanti’s green and yellow Benetton has spun in the hairpin. A turn later, Landis’s Benetton would spin in that same hairpin. Down the long straightaway, White passed Cook to take the lead, then Kaluzny also caught and passed Cook to take 2nd place. Richard White’s car takes the lead. 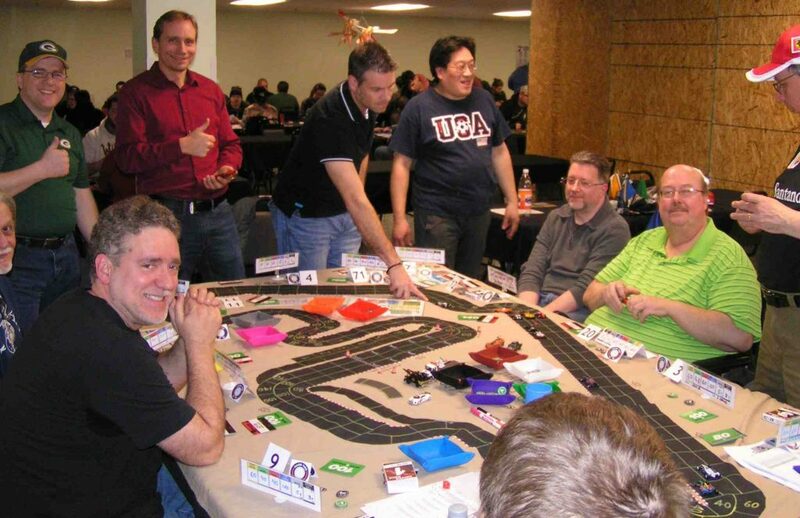 Pictured, from left: Richard White (black shirt); Mike St. Peter (can only see half his face); Mike Cook (dark green shirt); Gary Kempen (red shirt); Chad Marlett (pointing to Richard White’s leading car on the track); Greg Lim (USA shirt); Gary Sturgeon (gray shirt); Jim Landis (light green shirt); Jack Beckman (black shirt & red Ferrari hat). Also pictured is the back of Jim Magnanti’s head in the foreground. As the cars came to the S-curve at the end of the 2nd straightaway, the first six cars were all bunched up. They were running in the order: White; Kaluzny; Kempen; Sturgeon; Cook; and Beckman. Kempen was doing very well, indeed, to be in 3rd place after starting in 13th place. The top six positions are bunched up in the S-curve in the left side of the picture. 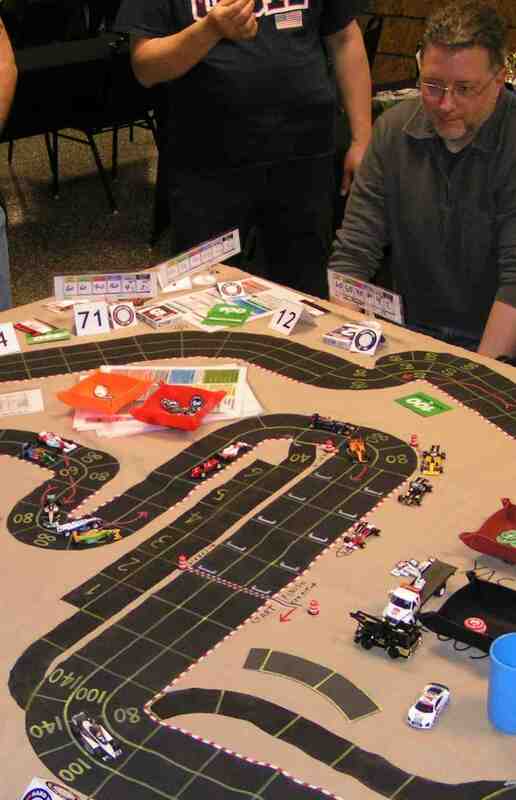 Gary Sturgeon, at far right, anticipates winning the championship as he will clinch the title by taking at least a single point, and he is currently in 4th place, good enough for 3 points. White and Kaluzny now battled for the lead, also while gaining a few spaces over the rest of the pack. Into the hairpin corner just before the last corner before the start/finish line, Kaluzny pulled even with White. Kaluzny pulls even with White at the 2nd hairpin corner. The rest of the running order: Beckman; Kempen; Sturgeon; Cook; Marlett; Lim; St. Peter; Magnanti; B. Robinson; Landis and Hernandez. Kaluzny now made a move to take the lead as he drove at 140 mph coming out of the hairpin, which put him into the final corner at 60 mph over the speed limit for that corner. He used his last two wears and used two -1 skill markers, and successfully made the chance table roll. He then pulled into the pits for the 2nd time. White, meanwhile, played it safe by only going 120 mph, thus ending his move just short of that last corner. Kaluzny had been talking with White just before this last turn, where Kaluzny mentioned how he had been leading a demo race on this same Yas Marina track, but how he didn’t pit at the end of the 2nd lap, but Jack Beckman did pit, and then Beckman was able to catch Kaluzny for the victory in that demo race. Kaluzny takes the lead and takes to the pits while White pulls up short of the corner. Notice the special orange and black McLaren “support” vehicle next to Kaluzny’s orange McLaren race car in the pits. Also notice Kempen’s red #4 Ferrari has spun on the outside of the hairpin. White cruised into the lead, and the closest cars on the track, Beckman, Sturgeon, and Cook, all had to pit as they had not pitted at the end of the 1st lap. 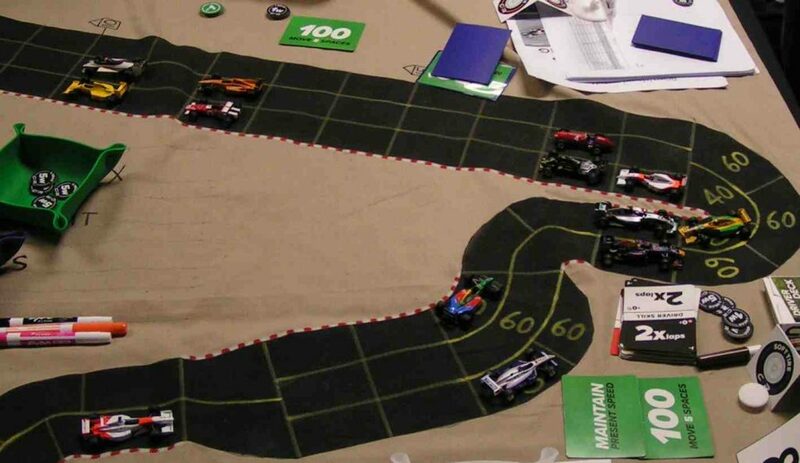 Just as those cars came into the pits, Kaluzny exited the pits, switching back to soft tires, exactly 10 spaces behind White’s Brabham, with Kaluzny having his full 15 wear and White having a total of 5 wear for the last lap after gaining 2 wear when he crossed the start/finish line due to his being on hard tires. White, though, used one of his precious wears in negotiating the 1st corner past the start/finish line at 120 mph, so he only had 4 wear left for the rest of the lap. White (blue and white Brabham in the near-left corner) now leads while Kaluzny (orange McLaren) leaves the pits. Beckman, Sturgeon, and Cook have just entered the pits. Gary Sturgeon looks on, still anticipating winning the CFR-Detroit 2017 Championship. As they came around the last corner before the start/finish line, the cars of Lim and Kempen pulled into the pits. Staying on the track were Marlett, Magnanti, B. Robinson, St. Peter, Landis, and Hernandez. The official order at the end of the 2nd lap was: White (+3); Kaluzny (+3); Marlett (-2); Magnanti (+7); Beckman (-2); B. Robinson (+3); Sturgeon (-1); Cook (-6); St. Peter (-1); Landis (-3); Hernandez (-1); Lim (0); and Kempen (0). Kempen was back in 13th place, where he had qualified, although he had been as high as 3rd place. 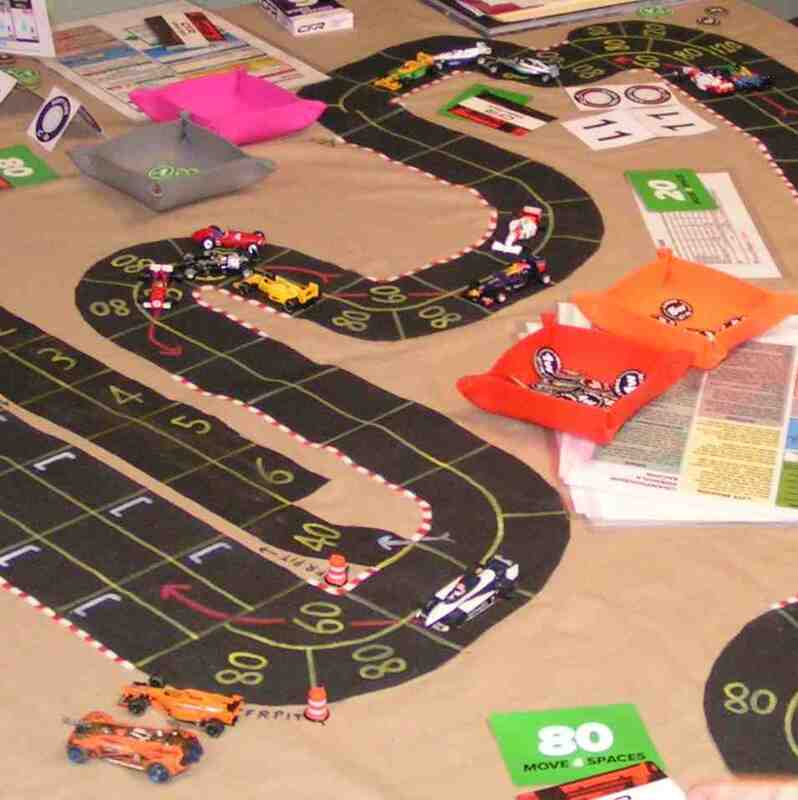 Sturgeon was now in 7th place, out of the points, but he still stood to win the championship if Mike Cook did not win the race, and Cook’s odds of winning the race were very slim at the moment as White had a 20-space lead over Cook after Cook’s pit stop. After the 2nd round of pit stops were resolved, the running order on the track was: White; Kaluzny; Marlett; Beckman; Magnanti; Sturgeon; Cook; B. Robinson; St. Peter; Landis; Hernandez; Lim; and Kempen. After the 2nd round of pit stops are complete, White leads by 6 spaces over Kaluzny as they speed down the straightaway. Kaluzny slowly crept up on White, then in the S-curve at the end of the 2nd straightaway, Kaluzny finally passed to take the lead. Beckman had managed to pass Marlett for 3rd, and Sturgeon was now in what looked like a safe 5th position, which would give him 2 points and the title. Kaluzny takes the lead from White just past the S-curve. Beckman, Marlett, and Sturgeon are approaching the S-curve. Farther back are Cook, Magnanti, B. Robinson, Lim, Landis (spun in the farther S-curve), Kempen, St. Peter, and Hernandez. Then on the next turn, Kaluzny drove 100 mph and took the inside, eschewing the cornering arrow. White drove 120 mph and pulled up next to Kaluzny’s McLaren, on the cornering arrow. Kaluzny and White are side-by-side with only a few corners left to race through. Landis, meanwhile, has recovered from his spin in the S-curves at the right of the picture, and now has St. Peter breathing down his tailpipe. But now Kaluzny took advantage of his having more wear remaining than White. Kaluzny plotted 100 mph, while White could only go 80 mph without resorting to taking chance dice rolls through the next two corners. 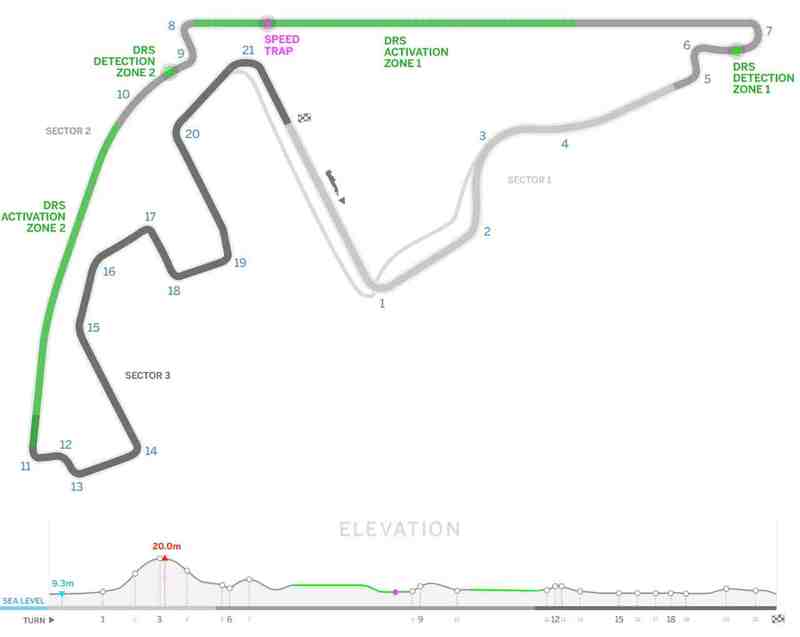 Kaluzny moved first by virtue of plotting a higher speed, taking the outside of the first corner (through the 80 mph spaces) for a 1-wear expenditure, then moving into the hairpin corner (spending another wear) so as to hog the last space of the corner, forcing White to pull in behind. Far back on the track, Hernandez rolled an unmodified chance at the S-curves in the middle of the two long straightaways and crashed his shiny new McLaren, thereby becoming the only DNF of the race and ending up in 13th place. Kaluzny regains the lead over White. Hernandez has just crashed in the S-curves at the right of the picture (note the safety car, flatbed truck, and yellow flag). Back at the 2nd of the S-curves at the end of the long straightaways, Kempen forced a pass through Lim and B. Robinson. Sturgeon and Marlett were having a spirited duel for 4th place. 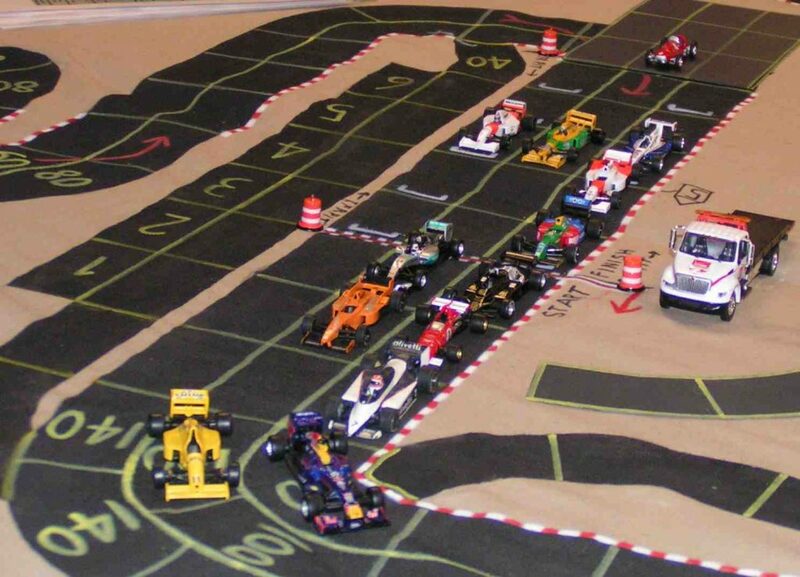 At the far left of the picture, Kempen (red Ferrari roadster) has just force-passed Lim (orange and white McLaren) and B. Robinson (white and blue car) and is alongside Magnanti (yellow and green Benetton). 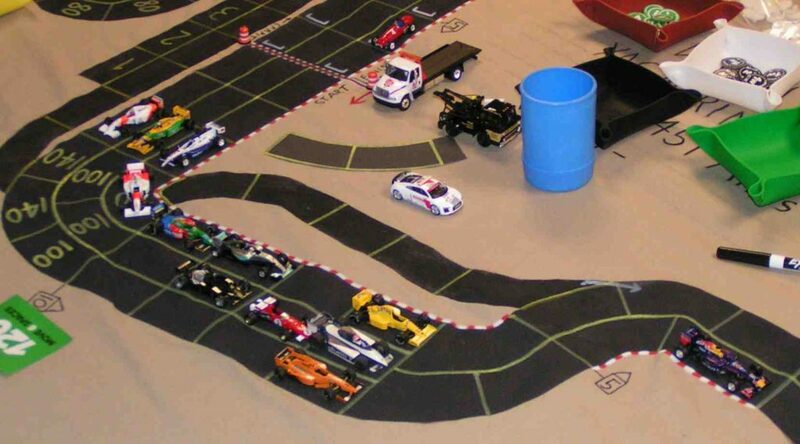 Kaluzny (orange McLaren) prepares to take the final corner before the checkered flag. Garry Kaluzny (+4) then cruised to the victory, his second of the eight-race 2017 CFR-Detroit racing season. Richard White (+2) took 2nd place, then Jack Beckman (0) finished in 3rd. Gary Sturgeon (+2) did take 4th place and 3 points, thereby earning him the championship of the 2017 season. Sturgeon clinches the championship with a 4th place finish! Cook (yellow car), Marlett (Red Bull), Kempen (red car), and B. Robinson (white and blue car) are all about to cross the finish line. Lim and Magnanti have both spun in the final corner right in front of St. Peter. There were now four cars, Cook, Marlett, Kempen, and B. Robinson, vying for the final two points-paying positions of 5th and 6th place. 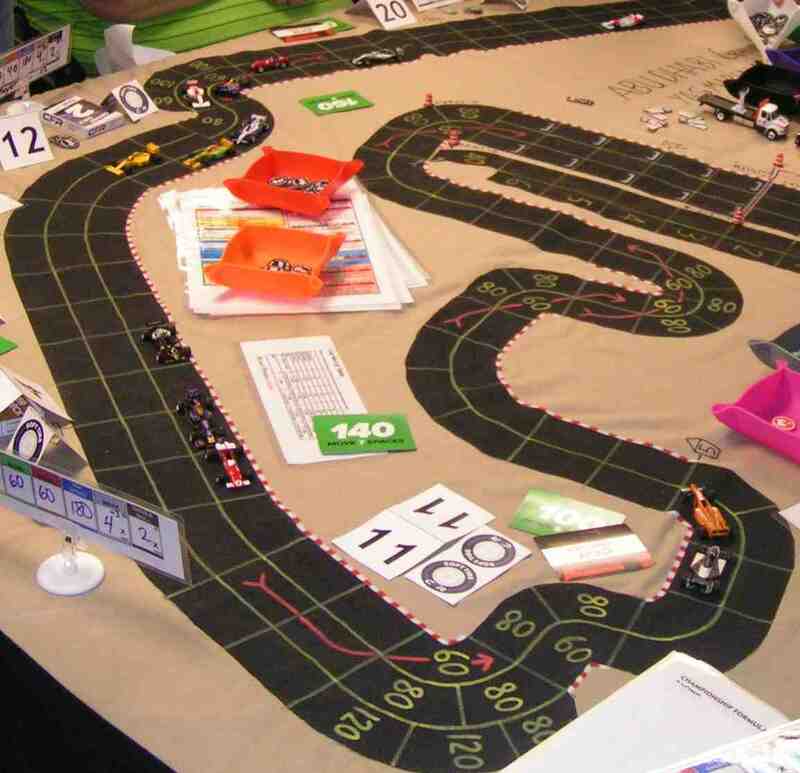 In CFR, if cars enter a corner past the finish line, they must pay for that corner using wear or rolling on the chance table the same as if they were still racing. 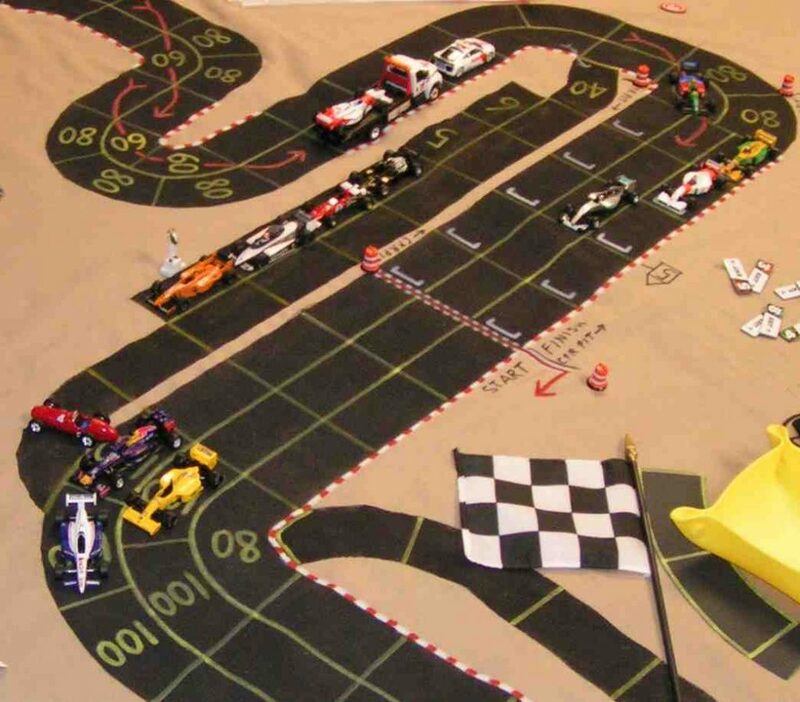 Any car that spins in the corner past the finish line is considered to have finished the race behind other cars that touched or crossed the finish line on that same turn. 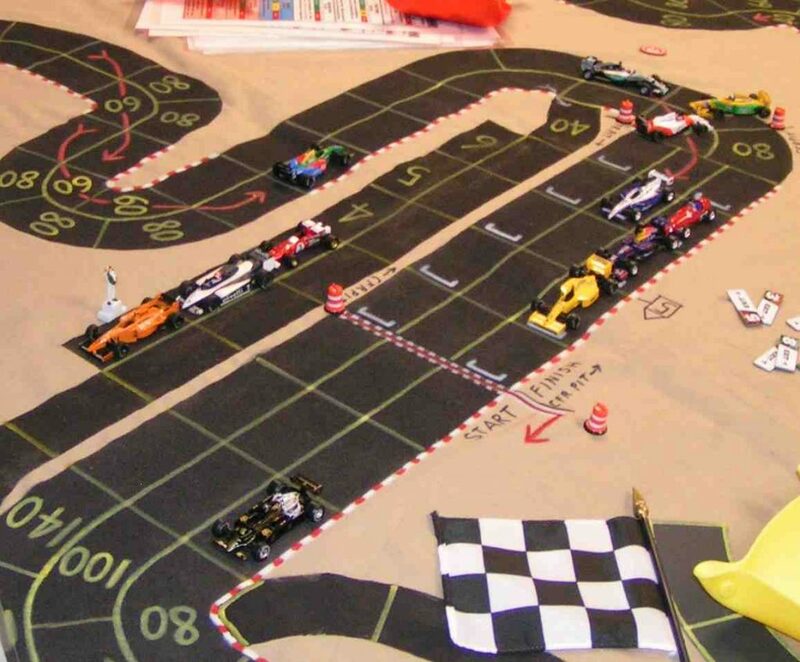 If a car crashes in that corner past the finish line, it is considered to have not finished the race at all and becomes a DNF. Cook moved first, at 100 mph. Not wanting to take a chance dice roll, Cook moved into the middle 100 mph space. Next, Marlett moved at 120 mph, taking the outside 140 mph space, also not spending any wear nor rolling on the chance table. Kempen moved next, at 160 mph, and attempted a forced pass on Marlett in the outside lane. Naturally, Marlett attempted to block the forced pass. 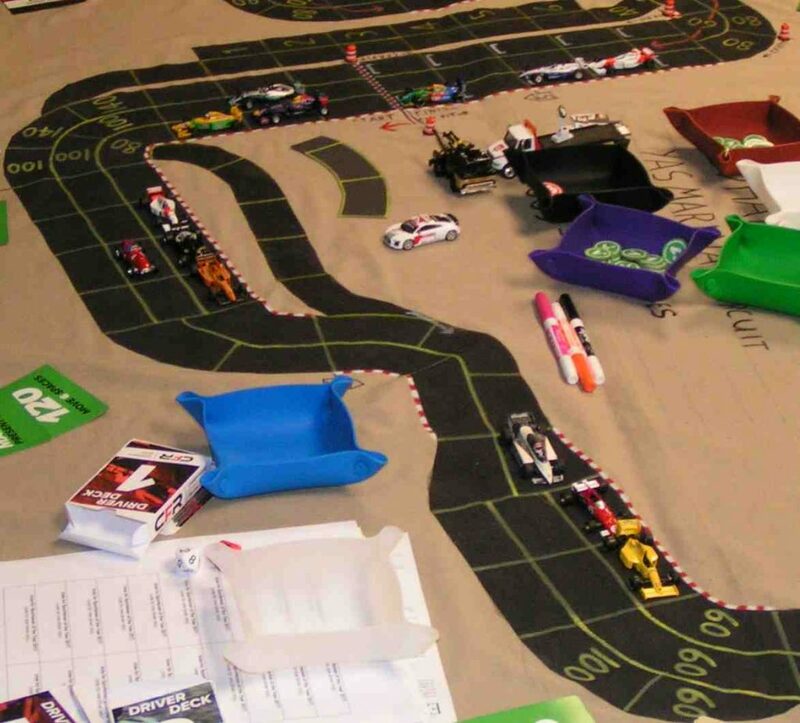 During the forced pass dice roll, Kempen rolled a “4” on one of the dice, meaning he had to spend a wear; however, he did not have any wear remaining, so his car spun in the same space as was occupied by Marlett’s car. Brian Robinson then moved at 160 mph. He made his forced pass over Marlett by using two -1 skill markers for his dice roll; he then used his -3 skill marker for a chance table roll, successfully making both rolls, and so effectively passed Cook, Marlett, and Kempen! Brian Robinson (+4) thus was classified in 5th place, and Mike Cook (-4) got the single point for 6th place. Finishing out of the points in 7th and 8th places, respectively, were Chad Marlett (-6) and Gary Kempen (+5). Brian Robinson forces a pass over Marlett to take 5th place. After the excitement of B. Robinson’s forced pass, the rest of the finishers were: Mike St. Peter (-1) in 9th; Jim Landis (-3) in 10th; Greg Lim (+1) in 11th; and Jim Magnanti (-1) in 12th. Mike Hernandez (-3), a DNF, was classified 13th. Points awarded at the Abu Dhabi Grand Prix: Kaluzny 10; White 6; Beckman 4; Sturgeon 3; B. Robinson 2; Cook 1. Immediately after the race was concluded, the Championship trophy of the 2017 CFR-Detroit racing season was presented to Gary Sturgeon. Sturgeon won two races during the season, and also finished 2nd three times, as well as finishing 4th twice. He only failed to score points in his first race, at Monza, where he finished 7th. After the championship trophy was awarded, it was time to vote for the recipient of the Tom Kane Memorial Award to be given to the most sportsmanlike driver of the 2017 season. Greg Lim was awarded the honor by the vote of his peers, earning 8 of the 13 votes cast. Tom Kane raced in our first Detroit area Speed Circuit campaign in 1984. 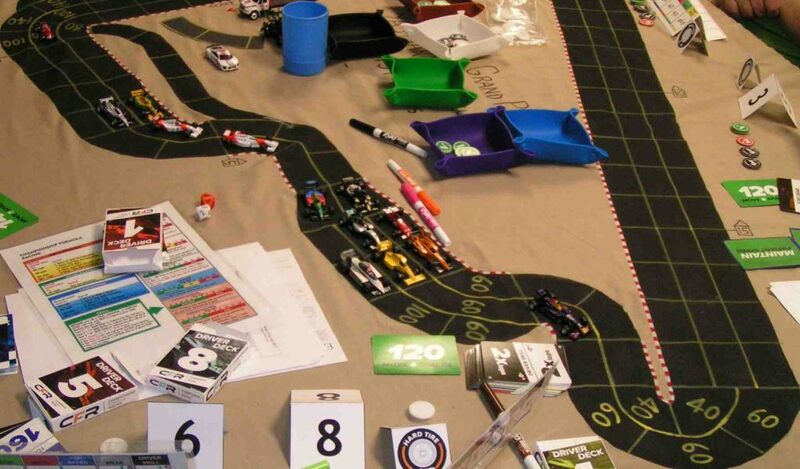 He was an extremely polite racer, and would shrug off adversity, like bad dice rolls. Unfortunately, Tom passed away near the end of that first Speed Circuit campaign. 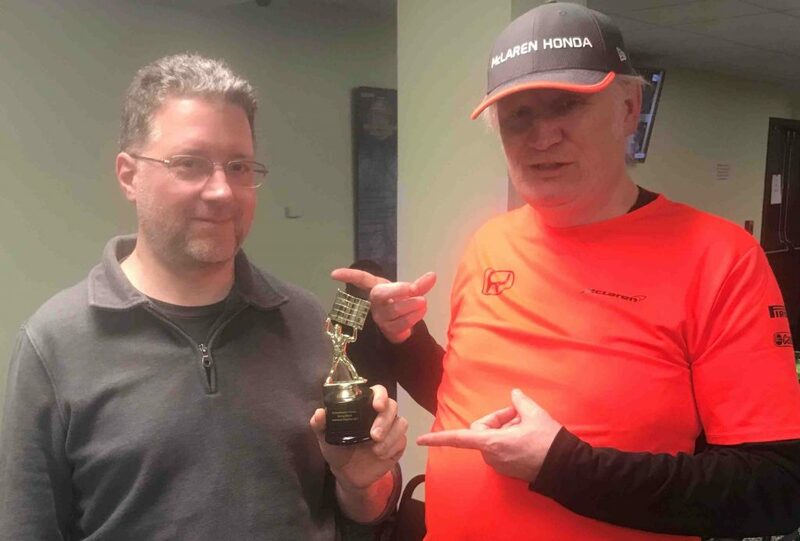 So we then decided to annually give the Tom Kane Memorial Award to the most sportsmanlike driver, as a way of keeping Tom’s memory alive. 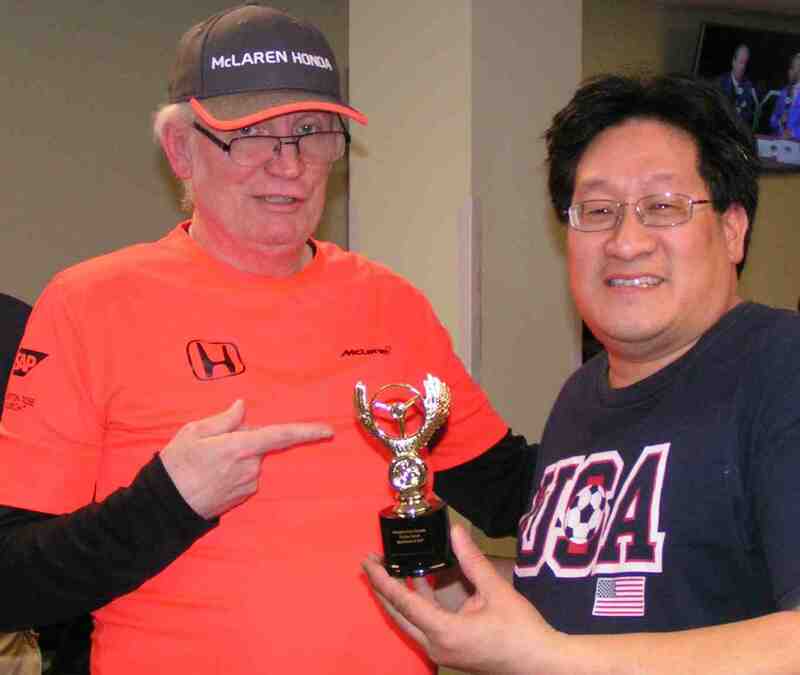 Greg Lim (USA shirt, right) receives the Tom Kane Memorial Award trophy from race steward Garry Kaluzny (orange shirt, left). The new 2018 season of CFR-Detroit will begin on Friday, May 11, 2018, at Guild of Blades game store in Clawson, Michigan. 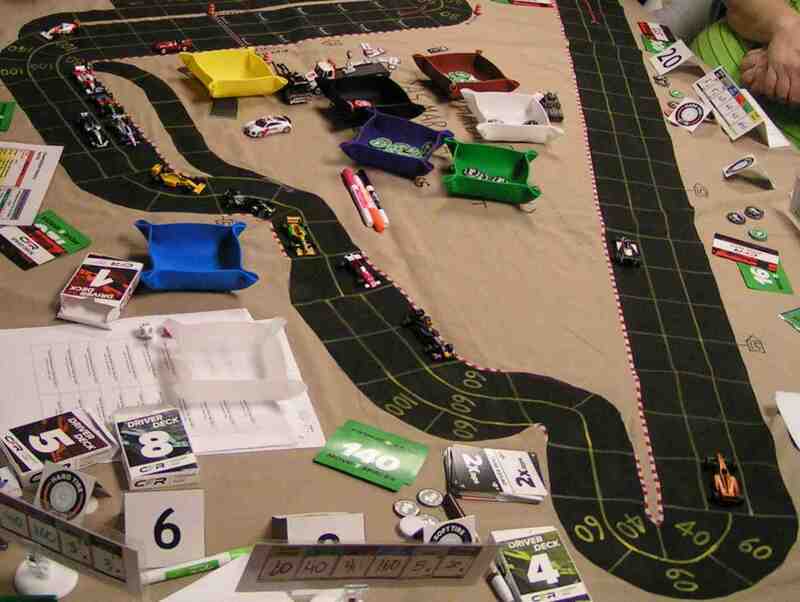 Race time is 6:45 pm, although drivers are asked to arrive by 6:15pm to setup their race car’s specifications. The new schedule is posted on the CFR-Detroit home page at http://michigumbo.com/cfr/. Also, check out the records from the 2017 CFR-Detroit season at http://michigumbo.com/cfr/2017/index.html. This entry was posted on Thursday, May 10th, 2018 at 3:22 pm	and is filed under Board Games, Miniatures Games. You can follow any responses to this entry through the RSS 2.0 feed. Both comments and pings are currently closed.